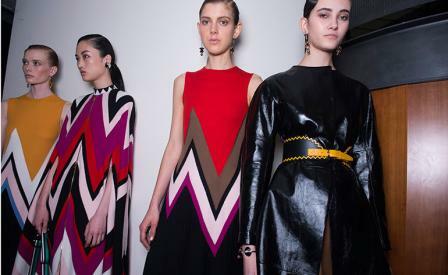 Mood board: A cheerful striped runway set the stage for Ferragamo’s autumn collection that splintered brilliant, bold colour through a pared down, modernist eye. Blocked, striped, zig-zagged and cut into eye-bending panels, the clothes managed to be both a graphic and a feminine delight – a seemingly simple equation which is actually no easy feat. Best in show: Long sleeved, flouncy dresses came with panels of black wool felt, their seams undone with gold zippers. Also exceptional were knit pleated dresses that were deconstructed into separate panels of red, magenta, black, white and khaki, an arousing palette that bounced off wonderfully from the striped runway. Finishing touches: Shoes are everything at Ferragamo. This season, mink front T-strap shoes with Kilim covered heels looked especially fresh, while the bags looked like bowling balls covered in collages of multi-coloured fur.